Situation. One of the most interesting open air Rock Art sites in the Swiss Alps is situated at Carschenna, Rethic Alps (Graubunden - CH), where Latin derived languages melt with German ones. The first engraved rocks were discovered in 1965, during the building of an iron electricity framework. The engraved rocks show not very large limestone surfaces polished by the glaciers during the last glacial period. All the engravings have been executed by pecking. It is possible to recognize the dots, mostly very large. Engravings. 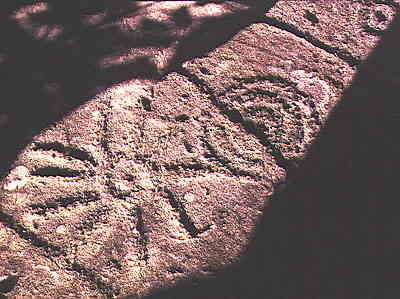 Carschenna engravings are mainly characterized by concentric circles and cup-marks. Also riding scenes and schematic horses are well present. Ten engraved rocks are known: the best preserved surfaces were probably underground. Cup-marks are usually surrounded by 1 to 9 circles. On the rock n. 7 we can find also spirals. Cup - marks are often related by long channels. On the rock n. 3 (picture above) we can find a solar representation. All the engraved rocks are under a thick wood of fir-trees. Superimpositions. Schematic horses and riding scenes are very similar to the Valcamonica ones. In Valcamonica (Alps) they are currently dated to the first Iron Age (VIII-VII century b.C. ), by comparisons with decorated pottery and by the fact that in this region the horse was not ridden before this period. At Carschenna schematic horses cover concentric circles: so concentric circles are more ancient, and must be dated to the Bronze Age. Regarding cup-marks and grooves, it must be noticed that long grooves relied with cup-marks often cut concentric circles So cup-marks and grooves are more recent, probably first Iron Age. The same occurs at Grosio Rupe Magna (Valtellina), where cup-marks and grooves cover Bronze Age and first Iron Age human figures. Interpretation. Carschenna concentric circles are identical to the Pontevedra (Spain) and to the Scottish ones. Likenesses can't be casuals, so they probably belong to the same culture. In the Alps we can find concentric circles in Valcenischia (Western Alps) and at Sonico (Valcamonica). At Sonico they are covered by little shovels of the first Iron Age. Carschenna engravings are not easy to interpret. Some scholars suggest a topographic key. They were studied by C. Zindel and G. C. Borgna. Imaging. The pictures have been taken with daily grazing light, obtained with sun and mirrors. Slides have been scanned by a slide transparency scanner.